If you’ve ever been to the dentist, you’ll know that most of your time there is spent having plaque cleaned off your teeth. Have you ever given much thought as to what plaque is? If not, then be prepared to be a little grossed out. Plaque is a ‘biofilm’, which means it’s a mass of bacteria and bacterial secretions. Just like the rest of your body, your mouth is home to many different bacteria, and not just the ones that can cause bad breath. The good news is that plaque, and teeth as a whole, are a great source of DNA that scientists can use to study the health and microbe biodiversity of our long-ago ancestors. As the biofilm builds up on your teeth, it can become calcified and preserve the DNA from any trapped bacteria, food debris, or even your own immune cells. This gives scientists a wealth of data to compare how the oral microbiome has changed over time. This important because it allows us to study the diet and health of our long-ago ancestors so we can compare it to our lives today. It can even give us hints about how our ancestors might have interacted with each other. How can you identify the bacteria in your mouth? For a long time, scientists would try growing unknown bacteria in a lab, but many bacteria can’t be cultured this way because they need very specific environments. Imagine catching a strange animal from the wild and trying to keep it as a pet. What does it eat? Does it need to stay warm? Does it have to live in water? What if too much oxygen is bad for it? Does it need to live with others of its kind? Now you can see the challenge of trying to grow unknown bacteria! Thankfully, with modern technology, we no longer have to try and grow each bacterium in the lab in order to identify it. We can instead use DNA sequencing to identify groups of bacteria by their individual DNA signatures. For bacteria, the most commonly used method is ‘16S ribosome sequencing’. The ribosome is a group of proteins and nucleic acids that work together to translate proteins from mRNA. The 16S ribosomal RNA (rRNA) is part of the ribosome and is very similar across bacterial species, which scientists call ‘conserved’ regions. Because this region is conserved, we can use a method known as PCR to copy the 16S rRNA region of each bacterial species and then use DNA sequencing to find out how many different kinds of bacteria are present in a sample. This technique can also be used for identifying bacteria in ponds, soil, and your dental plaque. To look at how our oral microbiomes have changed over time, Adler et al sequenced the 16S rRNA genes from the bacteria in plaque from ancient teeth all the way up through modern humans. They were able to compare the differences in bacterial species from people who lived 7,000 years ago in the Mesolithic/Paraneolithic era to people currently living today. They found that the composition of the oral microbiome changed during the Neolithic era (~6,000 years ago) when our ancestors started farming, and changed for the worse. One of the bacteria that increased after farming was the pathogenic P. gingivalis. So, it makes sense that while hunter-gatherers had very little signs of cavities or periodontal disease, people living in the Neolithic era had more problems with their oral health. 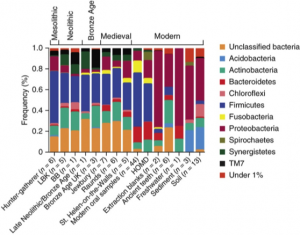 The oral microbiome from Mesolithic to Modern times. The oral microbiome remained much the same from after farming up through the late medieval period (~400 years ago), but the researchers found a big difference between modern humans and those living before the Industrial Revolution. This innovation in technology brought a lot of progress to society, including bountiful harvests of food, but it is also increased the presence of pathogenic bacteria in our mouths while decreasing biodiversity. We modern humans have a much higher frequency of S. mutans than our ancestors did (in fact, they didn’t find any S. mutans in people living before the Bronze Age) and S. mutans is known is contribute to tooth decay and cavities. What caused this change? We don’t know for sure, but one idea is the amount of sugar that became readily available in our diets after the Industrial Revolution. When certain bacteria like S. mutans eat sugar, they convert it to lactic acid and the acidic environment leads to tooth decay. This is why brushing your teeth is so important. As plaque builds up on your teeth, it provides a stable home for bacteria like S mutans. So, remember to brush your teeth, especially after eating your modern-day sugary foods!